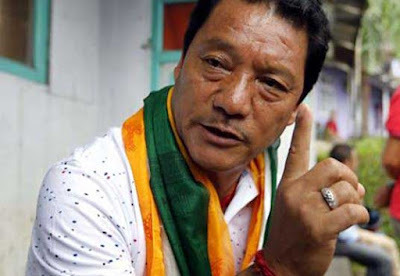 KOLKATA: Bimal Gurung isn't giving up. The fugitive GJM president has plans to enter the Hills yet again before the October 30 deadline and this time with more fire power, say intelligence agencies. The UAPA accused may even use a "human shield" with handpicked men from the tea garden bustees on the forest fringes to make it difficult for the police to open fire. The inputs serve a warning to the state police that apparently went into a "misadventure" on Friday by sending just around 20 policemen -without bulletproof jackets and headgears -to confront a 170strong Gorkhaland Personnel (GLP) force armed with AK47 and other sophisticated weapons, explosives and gadgets. It is another matter that police sent reinforcements later adding the total number to 100. It is quite evident from the recoveries made by the police following the pre-dawn encounter near Bengal-Sikkim border on Friday and the consequent raids across the Hills that the Gurung brigade has stockpiled huge arms and explosives from the Northeast to challenge the state's might. The men in uniform, mostly unfamiliar with the forest terrains along the border area were caught off the guards after they trekked 10 kilometres downhill to reach the spot even though they knew the location of the fugitive leader and also GLP training camp. The cops could have taken a tip from rebel GJM leader Binay Tamang who had a key role in forming the GLP nine years ago in 2008 and engaged the commando force of the state police now stationed in Darjeeling. Director general of police Surajit Kar Purakayastha is going to Darjeeling sometime next week. Police are now trying to penetrate among the Gurung loyalists and collect information on two key persons -GJM yo uth wing president Prakash Tamang and Gurung's trusted aide Dipak Bale. The duo is in touch with Sanjay Thulung alias Sanjay Rai, former GTA sabhasad from Tukdah-Glenburn constituency . Thulung is wanted by Darjeeling police and Assam Police in an arms case. According to police, Thulung has been working with GLP member Umesh Kami for five years since 2012 to draw up Bimal Gurung's security shield. CID on Saturday froze bank accounts of three Darjeeling-based businessmen who had been funding the Gurung faction. But what is Gurung up to? Intelligence sources say that Gurung, now in hiding, is not being able to come to terms with the winds of change in his party . He still believes that that he holds the sway in the Hills.He is thus desperate to make a public appearance in Darjeeling and tell the people that he has been made scapegoat because he has been fighting for Gorkhaland. He wants to don the "martyr's image" before he courts arrest. On Saturday , police arrested Dipak Tamang from Kalimpong's bustling momo market at Alagarah for his alleged involvement in the torching of the police vehicle on Friday. Two others have been arrested in connection with the IED blast at Kalimpong days ago killing civic volunteer Rakesh Rawat. Bimal Gurung isn't giving up. The fugitive GJM president has plans to enter the Hills yet again before the October 30 deadline and this time with more fire power, say intelligence agencies.